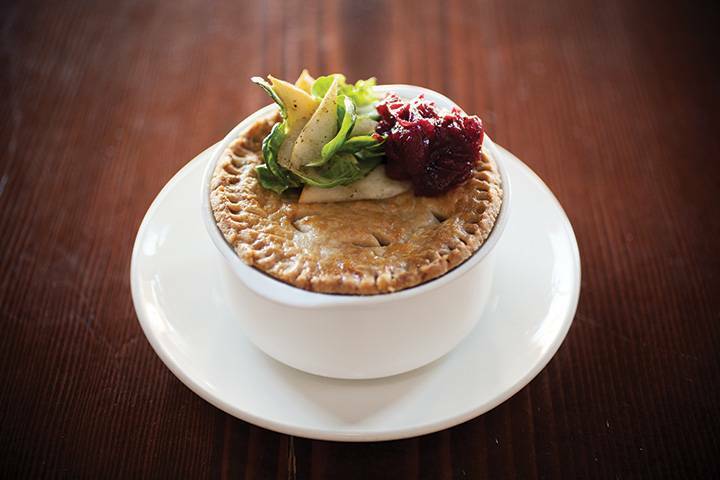 Three Victoria chefs share their favourite flavour traditions of the holiday season. For one of them, it’s not about the turkey but a simple farm-fresh boiled egg! Surprisingly, when asked about the holiday season, Heather says she doesn’t usually make Christmas dinner. “My mom or dad makes a classic turkey dinner.” Although at one time she was eating a raw vegan diet, nowadays she will eat a little meat but is mindful of where it comes from and what the animal has been fed. “So it’s more about the quality of the food rather than what it is,” she says. That’s not to say she doesn’t contribute her culinary skills during festive meals. Making the fruit cake involves food-processing almonds and dates and stuff to a gooey, doughy consistency that will hold the rest of the fruits together. Chocolate is a must, and her oma [grandmother] still gives her a traditional Sinterklaas Eve [Santa Claus Eve] present of a dark Dutch chocolate letter — an H, for Heather. In a food processor, process almonds to fine and set aside in a bowl. Place above ingredients in food processor and process to a creamy consistency. Add ground almonds and process to combine. Place in a mixing bowl. Chop nuts into small pieces and add to bowl with mixture. Place dried fruit in bowl with mixture and mix to combine. Press into an 8-inch square pan and place in the fridge to set. of dressing and sauté until kale is wilted. Add more dressing to taste. Serve warm, topped with toasted pecans. 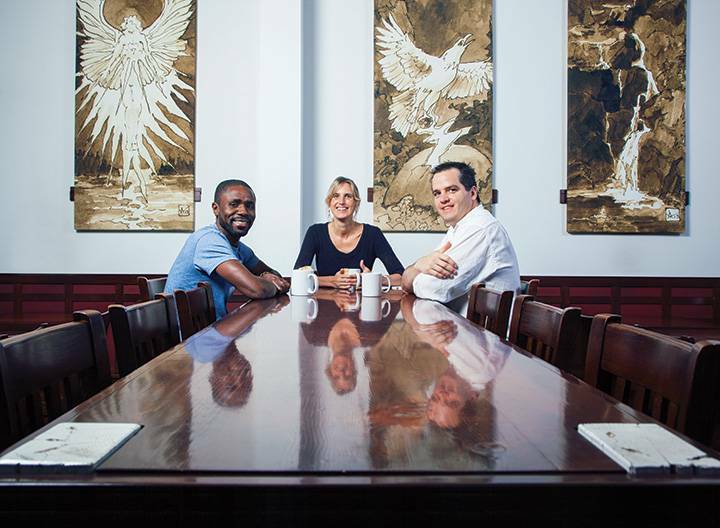 Executive Chef Castro Boateng left Ghana when he was nine and grew up in Toronto. His career has taken him to Scotland, the Cayman Islands and Bermuda, before moving to Canada and settling in Banff, and later Victoria. Having an English-born wife, Charlotte, who also spent time in the Caribbean, means the holiday season is a charming mishmash of cooking styles and traditions that speak to culture, family and travels. Although the Boatengs’ favourite holiday beverage is eggnog with rum and nutmeg, Castro will often make a Caribbean-style carrot-and-Guinness drink, using carrot juice, stout, condensed milk, fresh grated nutmeg, fresh ginger, a cinnamon stick and perhaps a little coconut oil. Other traditions for the Boateng family including Bofroat, a dense Ghanaian donut; rum ball; Bailey’s cheesecake; and, from England, Cadbury’s Roses chocolates. Oh, and new pyjamas for everyone on Christmas Eve and Castro’s favourite gift: a special ornament each for the tree. 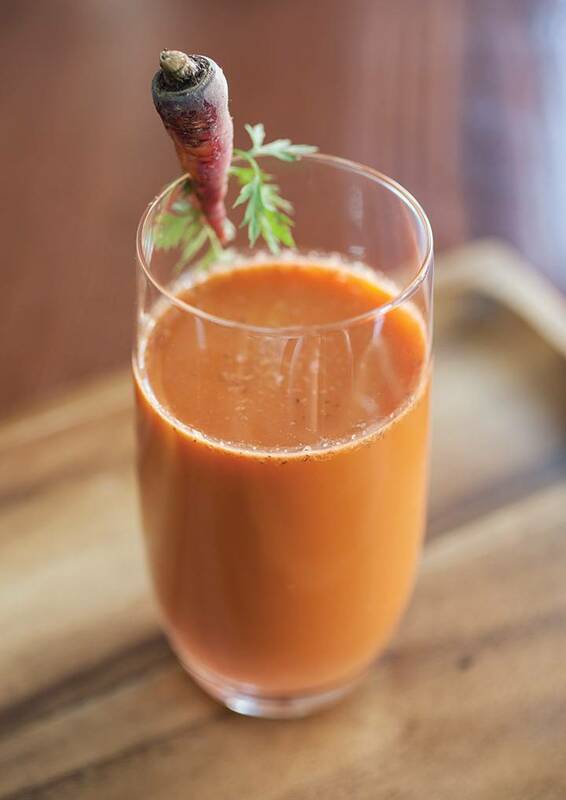 Using a juicer, extract all carrot juice and strain through a fine mesh strainer. Combine the carrot juice and the remaining ingredients except the coconut oil in a blender and blend for a minute. Slowly drizzle the coconut oil to emulsify. Chill for about an hour. Shake well and serve on ice (optional). Toss the nuts in the maple syrup and season with all the spices. Place the nuts on parchment paper on trays; roast in the oven for 1 hour or until the nuts are crisp. In a 3-quart saucepan, sauté onions in vegetable oil on low heat, approximately 2 minutes. Add the parsnips and apples to the saucepan and continue sautéing for a few more minutes. Deglaze the saucepan with the white wine until reduced by half. Season with salt and pepper. Add the stock and simmer for 20 minutes or until parsnips are tender. Purée the soup in a blender until smooth; add apple juice to adjust the flavour and consistency. Combine the port and sugar in a small saucepan and reduce on low heat until syrupy. Pour soup into soup bowls and drizzle with port reduction. 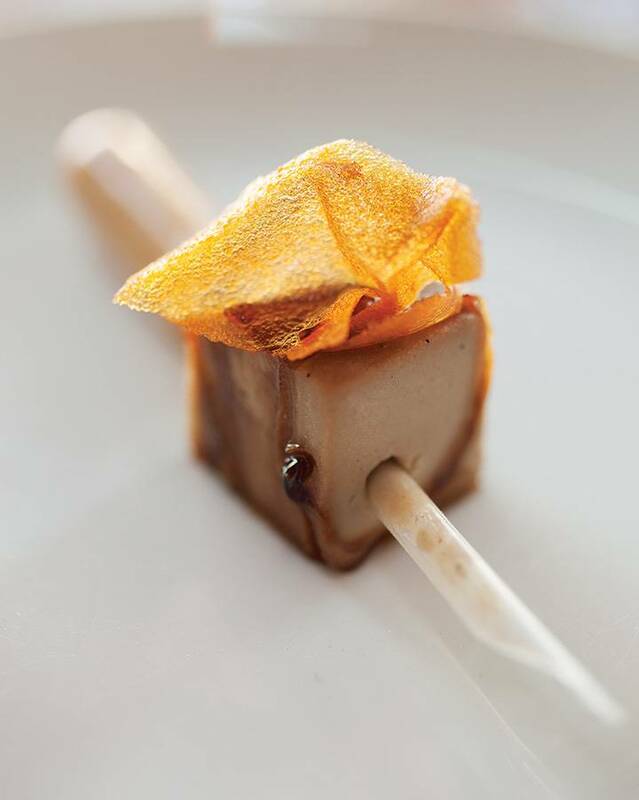 Many chefs keep their “secret” recipes to themselves, but Stephan was happy to share his with YAM readers. Having moved away from the family back east, holiday celebrations these days are quieter affairs for Stephan, but the pork theme continues, with ham hocks served on a bed of split peas. One dish Stephan simply won’t do without during the holiday season is cretons. 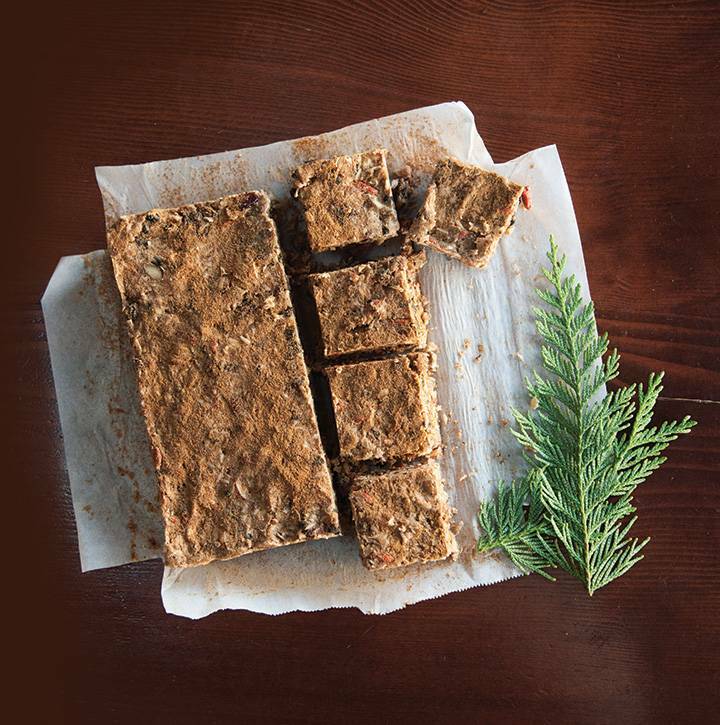 “This easy, rustic pâté tastes of the holiday season for me,” he says. On medium heat, sweat minced onion in oil and add garlic. Sweat 1 minute more and crumble in ground pork. Stir ground pork to break it up and cover with stock. Bring to a simmer. When simmering, add dry spices and seasoning. Start with just a bit of salt, so that it doesn’t become overly salty as the stock reduces. Stir often to prevent sticking or scorching. Reduce the liquid slowly to achieve a homogeneous mix resembling oatmeal or quicksand. Add thyme leaves and maple syrup, stir and adjust seasonings to your taste. 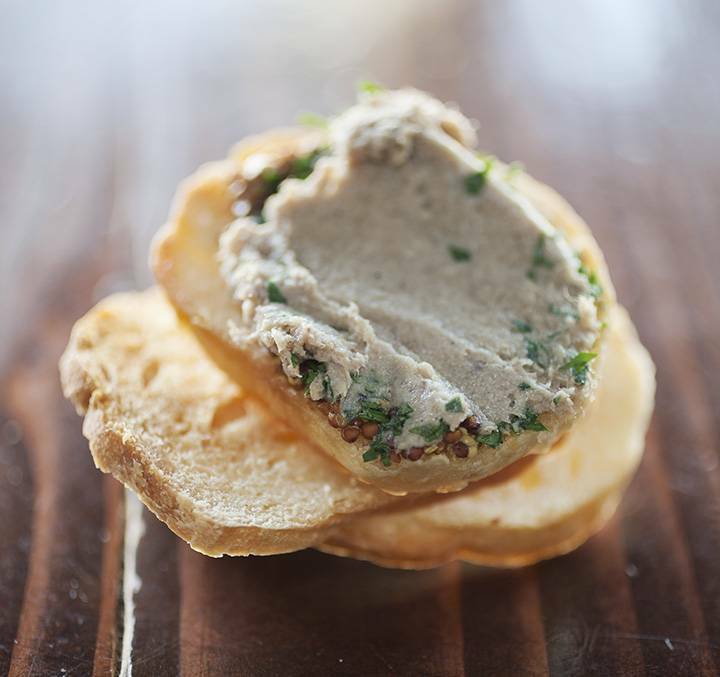 When cooled, the cretons will resemble a coarse country-style pâté and some fat will have settled on the top. This is normal and delicious but also easily removed if it is unwanted. To make a 5% brine, dissolve 1 cup of salt per gallon of hot water. Feel free to add spices or herbs to the brine. Stephan uses fennel fronds. If using, add cumin seeds when the brine is still warm. Allow brine to cool completely (otherwise you’re just making a bad soup) and place pork shoulder in a container, cover with brine and leave 24 hours. Remove from brine and place on a resting tray to allow excess brine to run off. Mix brown sugar, fennel, cumin and coarse ground peppercorns and rub over the entire pork shoulder. Allow to cure overnight. In a large pan, heat oil till it shimmers and sear the pork shoulder on all sides over medium-low heat. Add 1 onion and 1 carrot and celery. Sweat briefly in the pan. Remove pork shoulder and vegetables to a braising tray large enough to hold the shoulder comfortably. Pour out any oil from the pan and scrape out any darkened bits. Deglaze with chicken stock and bring to a boil. Pour stock into braising pan with the pork and mirepoix [roughly copped vegetables] and cover with aluminum foil. Place into preheated 275°F oven and cook for 4 to 6 hours. Depending on your oven, the times could vary. You are looking for the meat to pull apart easily. Allow to rest in the braising liquid about 20 to 30 minutes when done. While it is cooking, dice the parsnip, 1 onion and fennel. Sweat lightly in a bit of oil and reserve. Remove pork shoulder from liquid and allow to cool until you can handle it. Strain braising liquid into smaller pot and reduce until thickened. Taste periodically to ensure the flavour doesn’t become too salty. Remove from heat and thicken with a little bit of cornstarch if you feel the sauce may become too salty for your taste. Season with Dijon mustard to taste. Remove bones from pork shoulder and break up the meat. Mix pork with vegetables and moisten with thickened braising liquid. Add thyme to mixture and allow to cool. Put mixture into pie shells of your choice, brush top of the pie shell with an egg wash and bake at 350°F until pie shell is cooked fully and contents are hot.